“Just by being out you’re doing your part. It’s like recycling. 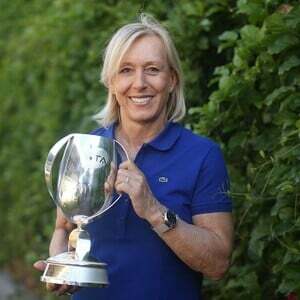 You’re doing your part for the environment if you recycle; you’re doing your part for the gay movement if you’re out.” Martina Navratilova is a Czech tennis star and from 1970 to 1980 was one of the world's top tennis players. She was one of the first openly gay athletes during her time and would constantly speak out for LGBTQ rights. Her contributions also include millions in endorsements and sponsorship due to her ability to speak her truth. At a young age she found her passion in tennis mainly due to it being in her blood. Navratilova's grandmother had been an international player who had a rivalry with Vera Sukova, a 1962 Wimbledon finalist in a national tournament. she moved to the Unites States at the age of 18 and was alone. However, her dedication and hard work paid off when she won her first Gland Slam tournament in 1978, winning against the American player Chris Evert. she continued winning the Wimbledon title and in 1981 won her third Glam Slam victory in an Australian Open. By 1980 she was the most dominant player, obtaining both Wimbledon and French Open crowns. From 1982 to 1984 she lost only six matches and won 18 Grand Slam singles titles, 10 Grand Slam mixed doubles, and 31 Grand Slam women's doubles championships. However, her biggest success occurred at Wimbledon where she got to 12 singles finals, which made her win nine titles. In 1994 she retired from singles play but continued on playing in doubles matches and in 2013 she won the mixed doubles championship. She also had a win at the U.S. open, three years later. In the 2014 U.S Open she decided to propose to her girlfriend Julia Lemigova and the couple wed on December 15, 2014 in New York City. She continues to be a vocal advocate for equal rights and a strong supporter of many charities that benefit the LGBTQ community. Receiving along the way many awards from many distinguishable organizations withing the LGBTQ community.